I enjoyed small funny moments in South Korean mockumentary film “Cheer Up, Mr. Lee”, and that was why I was relatively let down by what was shown around its ending. I know the characters in the movie are not that talented, but it seems they are hopelessly mediocre filmmakers instead of incorrigibly awful ones. Their end product in the movie lacks a comic punch as the finale, and it just drones on and on for around 10 minutes until a short but funnier scene appears and then the end credits follows. Nevertheless, how these guys struggle for their first opportunity is fun to watch. One of them is Lee Byeon-heon(Hong Wan-pyo), who is absolutely not connected with a well-known South Korean actor Lee Byeong-heon. He is a 30-year-old director/screenplay writer who has not yet made his first movie, and his situation becomes more desperate when he quits his job after a trivial quarrel on the movie set. Now he may have more time to write his screenplay he has been working on, but he looks pretty lazy in front of the documentary crew following him closely everyday. He drinks with his friends at night, and then he wakes up late in the next morning(or afternoon). He turns on his laptop as soon as he is awake, but it takes at least 7-8 hours for him to set himself on work mode. After cleaning his home, watching some movies(he usually watches bad movies for boosting his confidence), and preparing and eating his dinner, he finally seems to be ready to type something, but he soon goes out for drink again(his average actual work time is less than 1 hour). This cycle goes on and on, and we only see him changing the font of his screenplay title – and he has not written anything yet beside that. Personally, I am relieved to know that I have been quite productive in my recent thesis writing compared to this guy. Observing Byeon-heon’s endless laziness, the documentary crew behind the camera naturally become frustrated with him a lot. We see them seriously discussing about whether they should change the focus or abort the production, but, surprise, their subject turns out to be not as lazy as they thought; Byeon-heon has somehow completed his screenplay in the end, and, according to a famous South Korean director in cameo appearance, it seems to be fairly good enough to be produced into a successful feature film despite its cheesy title. As his screenplay goes around several production companies, we come to know more about Byeong-heon’s close friends/colleagues who also have not made a proper debut yet. Kim Beom-soo(Yang Hyeon-min) is a freelancing producer who tries too hard and too much whenever he talks. A rookie cinematographer Rho Seugn-bo(Heo Joon-seok) looks more pragmatic than others, but he is also jobless, so he is always obedient to his dear wife who earns dough instead of him. In case of Kim Yeong-hyeon(Kim Yeong-hyeon), this nameless actor did appear in few movies, but his appearances were very brief and barely recognizable, and nobody is interested in casting him or calling him for audition at present. When Byeong-heon’s screenplay is finally accepted by some production company, Byeong-heon and his friends are delighted to hear that news and start hoping for the best, but, as some of you know, that does not promise anything to them in fact. After all, filmmaking is business, and the production company begins to check more thoroughly whether Byeong-heon’s screenplay is really profitable from Day 1. They point out flaws and problems. They suggest omissions and revisions. They demand more, and the time quickly passes by as Byeong-heon and others keep discussing and writing during this long pre-production process. I have no idea about how much the reality of South Korean movie business is reflected in the movie, but I have indirectly heard about young frustrated South Korean filmmakers below the industry through several articles, and the director/screenplay writer Lee Byeong-heon, who previously worked with Kang Hyeong-cheol in “Speed Scandal”(2008) and “Sunny”(2011), gives us a hilarious tragicomedy reflecting that sad reality. With the serene narration by Jo Hyang-gi, its comic scenes are low-key as expected from its mockumentary style, but they will give you lots of laughs as they show the characters as a bunch of losers who will probably never get out of their respective bottoms unless miracle happens. They try, but they get frustrated, and then they drink at night as before, and nothing is changed for them as usual. 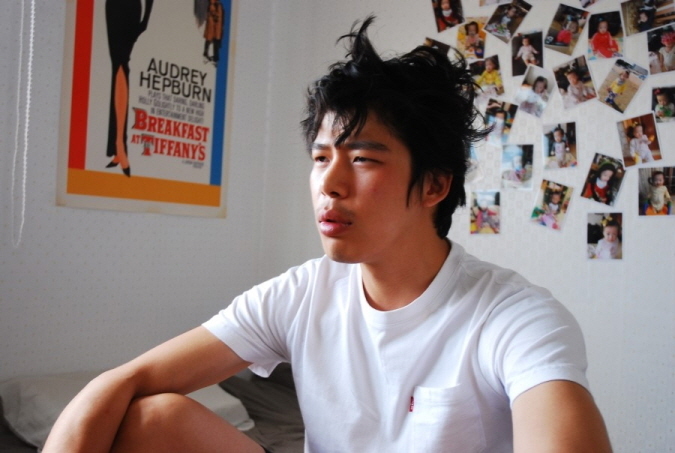 It is apparent that Byeong-heon’s struggle in the movie is partially inspired by the director’s personal experience, and the director does not hesitate to make a fun of his fictional self-portrayal. We may sympathize with Byeong-heon’s desperate circumstance, but he is also a petty and pathetic loser who harasses his ex-wife with sudden visit in the middle of night just because he is drunk and he wants to see his little daughter. His ex-wife, who is incidentally not shown in the movie, handles him sensibly, and so does a female employee of the production company, who puts her work first even when she happens to be stuck with two guys in a summerhouse. The movie loses some of its edges as approaching to its predictable ending during the third act, but it is still an amusing comedy, and I came to feel sorry for these hopeless losers in spite of their unlikable sides. I think the movie could have been more mercilessly funny, but I guess sometimes you have to cheer them up regardless of whether they are really talented or not. At least they keep trying, don’t they? This entry was posted in Movies and tagged Comedy, Mockumentary, Movie Director, South Korean Film. Bookmark the permalink.